High refractive index dielectric nanostructures have original optical properties related to the presence of optical resonances which depend on their shape and dimensions. These nano-objects are increasingly studied as alternatives to plasmonic nanostructures to enhance and control light-matter interaction at the subwavelength scale. Applications include photovoltaics, enhanced spectroscopies, photonics and dielectric metamaterials. 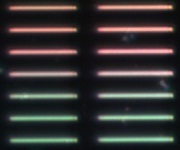 Optical resonances (Mie modes) are visible in Figure 1 showing silicon nanowires etched in the silicon layer (100 nm) of a silicon on insulator substrate (SOI) Depending on the width of the nanowires (from 50 to 500 nm), the wavelength of the scattered light is modified. High index dielectric nanostructures can also be regarded as nano-antennas capable of transforming a freely propagating EM wave into an optical near-field localized in and around the nano-antenna. This property allows modifying the emission of light by emitters placed in the near field of the nanostructure. In Figure 2, silicon nanocrystals are implanted in a silica substrate 3 nm below a silicon nanowire. The photoluminescence map shows an enhancement of the signal in the presence of the nanowire for an excitation wavelength matching a Mie resonance of the nanowire. The presence of resonances allows users to modify or improve the nonlinear properties such as second harmonic generation (SHG). Thus, no SHG is detected in the absence of resonance while a relatively intense emission is observed if the resonance wavelength coincide with the one of the fundamental and/or SHG (Figure 3). The different resonances depending on the diameter silicon nanowires also provide access to the various contributions of the SHG. In Figure 4, NW of two different diameters excited in similar conditions emit SH with different origins. In the first case (small diameter), the SHG is due to strong electric field gradients in the volume whereas in the second case, it originates from the contribution of surfaces.